Padcaster Expands Product Line with Padcaster for iPad Pro 9.7"
Padcaster's newest model for iPad Pro 9.7" expands product line even further to offer a unique, customizable mobile production studio solution. Padcaster for iPad Pro 9.7"
Padcaster provides a portable, all-in-one mobile studio that can be customized for any iPad model, and the individual needs of a variety of professionals. Padcaster has recently launched their newest model, Padcaster for iPad Pro 9.7”, which expands their product line to include custom-fitted Padcaster models for iPad Pro 9.7”, iPad mini 1-4, iPad Air & Air 2, and legacy iPad generations 2 – 4. Created to transform an iPad into an all-in-one mobile production studio that enables iPad users to shoot, edit, stream and share professional-quality video content, Padcaster’s unique design adds stabilization, as well as audio and optical upgrades, including a lens mount with a 72-58mm step-down ring, .45 wide-angle lens, unidirectional microphone to provide enhanced audio, dual microphone and headphone cable, and a cold shoe adapter. Padcaster’s rugged, commercial grade aluminum frame and urethane insert securely holds an iPad and provides both a lightweight and durable solution for a solid grip. Accessories such as lights, tripods, green screens, teleprompters and more, give professionals the opportunity to customize Padcaster’s set-up for their unique requirements. The current Padcaster line, which provides users with a sleek, portable, professional mobile studio for iPad Pro 9.7”, iPad mini 1-4, iPad Air & Air 2, and legacy iPad generations 2 – 4, retails for $399. Additional accessories are available to customize any Padcaster to specific needs and requirements. All of Padcaster’s unique, customizable frames and accessories, as well as the recently launched Padcaster Cage System for GoPros and DSLR cameras ($139) can be purchased online at Padcaster.com. 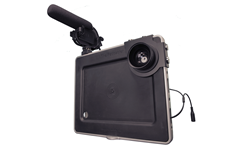 Padcaster for iPad mini generations 1 – 3 can also be purchased online at Apple.com. For more information on Padcaster, visit http://www.padcaster.com. Featured in Apple’s “Your Verse” international advertising campaign for the original iPad Air, as well as the iPad Air 2 “Change” campaign, and Visa’s “Visa Checkout” campaign, Padcaster is a patented, rugged multifunctional iPad case that transforms the iPad into an all-in-one mobile production studio. The Padcaster enables consumers to shoot, edit and upload video on the fly - or stream live right from the iPad. More than an innovative way to mount an iPad to a tripod, Padcaster transforms the iPad into an all-in-one production tool that enables a new category of convenient and cost-effective professional quality video documentation and production. For more information visit Padcaster.com.